As someone who hasn't read the Victor Hugo novel and is only vaguely familiar with the musical based on it, I can't say I went into director Tom Hooper's version of Les Misérables with any expectations or cultural baggage. I suspect that's part of the reason why the film worked for me—or, at the very least, why I was willing to forgive its shortcomings. If you want to see a subtle, nuanced piece of cinema, look elsewhere. Les Misérables is supersized in every regard, a battering ram of emotion and sensation. It's tiring and it's too long, and yet, by the end of the damn thing, I couldn't deny I had been properly worked over. The film, whose cast members sang their songs live on set, stars Hugh Jackman as Jean Valjean, a freed prisoner who tries to start a new life as an upstanding member of French society. Unfortunately, that requires him to violate his parole, which attracts the interest of Inspector Javert (Russell Crowe), who wants to bring him to justice. That chase is just part of this 160-minute film, which covers a wide span of years and culminates in the violent uprising in Paris of 1832. 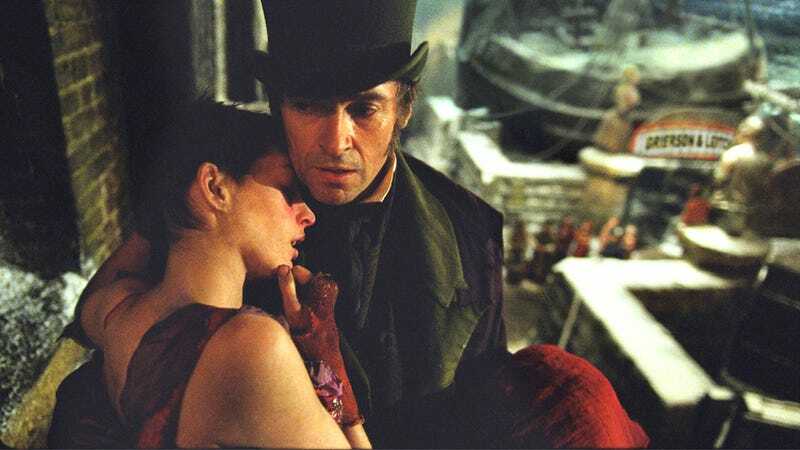 Love, war, death, forgiveness, regret, creaky comic relief, tons and tons of singing: Les Misérables has it all, and Hooper's version makes sure it all washes over you with a boisterousness that leaves no room for ambiguity. It's a sign of this movie's full-on assault that I keep forgetting that Les Misérables wasn't in 3D—it just feels like it's coming right at you, a sensation that is amplified by Hooper's choice to use slightly fisheye lenses, handheld cameras, and closeups on his singing cast members. For lovers of musicals, I can understand why this Les Miz may feel like an assault, not to mention an insult. But I have to admit that beyond some pacing problems and a few questionable casting choices, the movie worked for me as a towering, somewhat lumbering monolith of entertainment disbursement. Though Hooper, who previously directed The King's Speech, takes the story incredibly seriously, there's an undeniable showmanship to the whole thing that I found engaging. In this way, it's not unlike watching a lot of popular (which isn't the same as calling them "good") musicals: This Les Misérables flaunts a bold, albeit impersonal streak, girding itself for the next big showstopping set piece before catching its breath and starting up all over again. It's no chamber piece—it's more like an arena-rock show. I suspect that on some level Hooper understands this. I've been told that this adaptation is rather faithful to the original musical, and I'm grateful he doesn't dare try to make Les Misérables "relevant" to modern audiences. If you want to interpret the musical's themes of revolution and justice as a commentary on the Occupy movement, hey, that's your prerogative. But it really just seems like Hooper wants to deliver a big, brash, old-fashioned whirligig in which every emotion is clearly telegraphed and every character is some sort of type. Hooper's cast seems to get this, too. Jackman, who's won a musical Tony, is all conflicted heroism as Valjean, effortlessly able to turn his songs into emotional signposts that mark the different stops on his character's arc. Likewise, Anne Hathaway as the doomed Fantine is nothing but noble, wretched desperation. (Considering that Jennifer Hudson won an Oscar for one good song in Dreamgirls, it's hard to see how Hathaway won't do the same thing thanks to "I Dreamed a Dream," which is a powerhouse tune she nails.) And Eddie Redmayne successfully takes over the movie in the final third as the dashing Marius who will sweep Cosette (Amanda Seyfried) off her feet. Really, with the exception of Helena Bonham Carter and Sacha Baron Cohen, who play the deeply unfunny scoundrels the Thénardiers, the only major mistake is Crowe, whose one-note Javert is flat rather than imposing or tortured. Others have knocked his singing, but I don't think it's a matter of technical skill so much as his odd choice to deliver everything in the same low baritone. In Les Misérables, you want to feel Javert's frightening presence around every corner, but here he just hangs out looking glum. But despite its limitations, the movie continues to build as it prepares for its large-scale finale, and Hooper removes the last vestiges of restraint. Epic battle scenes, epic death scenes, epic reconciliations: I suppose it's completely reasonable to object to the onslaught that Les Misérables unleashes from a rational, objective perspective. But by the end, I confess I was no longer able to have any such perspective. Put bluntly—which is the only way this movie does anything—the last 30 minutes or so deliver the goods with a confident, fevered intensity. Not since Titanic have I felt myself so completely surrendering to a filmmaker's thundering commitment to ensuring that I felt something. Les Misérables is far, far from perfect, but it knows what it is, and it goes about doing that pretty damn well. You can get annoyed by how manipulative it is, or you can just submit. All in all, I'm glad I made the choice I did.